Julia is a 55-year-old-woman referred for an evaluation. You are assigned to complete the Cognitive Linguistic Quick Test-Plus (CLQT+) with Julia and report your findings. Julia’s average clinical clock hour time for mastery level competency is 45 minutes. This simulation is presented in partnership with NCS Pearson Inc. To learn more about Pearson’s Training Partnership Program, click here. Julia’s average clinical clock hour time for mastery level competency is 45 minutes. Bob is a 73-year-old-man referred for an evaluation. You are assigned to complete the Cognitive Linguistic Quick Test-Plus (CLQT+) with Bob and report your findings. Bob’s average clinical clock hour time for mastery level competency is 60 minutes. This simulation is presented in partnership with NCS Pearson Inc. To learn more about Pearson’s Training Partnership Program, click here. Bob’s average clinical clock hour time for mastery level competency is 60 minutes. Megan is a 31-year-old-woman referred for an evaluation. You are assigned to complete the Cognitive Linguistic Quick Test-Plus (CLQT+) with Megan and report your findings. Megan’s average clinical clock hour time for mastery level competency is 45 minutes. This simulation is presented in partnership with NCS Pearson Inc. To learn more about Pearson’s Training Partnership Program, click here. Megan’s average clinical clock hour time for mastery level competency is 45 minutes. Duane is an 8-year-old-boy referred for an evaluation. You are assigned to complete the Clinical Evaluation of Language Fundamentals Screening Test (CELF-5 Screening Test) with Duane and report your findings. This simulation is presented in partnership with NCS Pearson Inc. To learn more about Pearson’s Training Partnership Program, click here. Duane’s average clinical clock hour time for mastery level competency is 30 minutes. Duane is an 8-year-old-boy referred for an evaluation. You are assigned to complete the Clinical Evaluation of Language Fundamentals (CELF-5) with Duane and report your findings. Duane’s average clinical clock hour time for mastery level competency is 90 minutes. Larry is a 76-year-old-man referred for an evaluation. You are assigned to complete the Cognitive Linguistic Quick Test-Plus (CLQT+) with Larry and report your findings. Larry’s average clinical clock hour time for mastery level competency is 60 minutes. This simulation is presented in partnership with NCS Pearson Inc. To learn more about Pearson’s Training Partnership Program, click here. Larry’s average clinical clock hour time for mastery level competency is 60 minutes. JJ is a 10-year-old-boy referred for an evaluation. 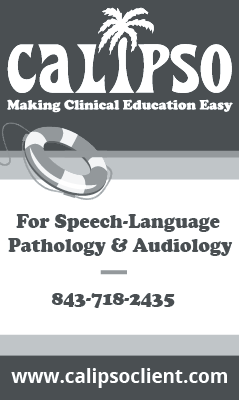 You are assigned to complete the Clinical Evaluation of Language Fundamentals Screening Test (CELF-5 Screening Test) with JJ and report your findings. JJ’s average clinical clock hour time for mastery level competency is 30 minutes. JJ is a 10-year-old-boy referred for an evaluation. You are assigned to complete the Clinical Evaluation of Language Fundamentals (CELF-5) with JJ and report your findings. JJ’s average clinical clock hour time for mastery level competency is 90 minutes. Angie is a 24-year-old female who is in her first year as a sales representative requiring her to go to trade shows and talk 8-10 hours per day. About 3 months into her job, she reported noticing increased vocal fatigue and a "gravelly" voice quality. She was referred to the voice center for a laryngeal imaging examination. You are the speech-language pathologist assigned to rate her stroboscopy. Angie’s average clinical clock hour time for mastery level competency is 10 minutes. NEW! Gain access to hundreds of observation videos.